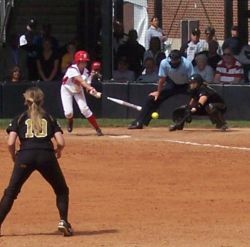 The Missouri Tiger softball team will get Saturday evening off while DePaul, Illinois, and Bradley battle it out for the right to meet Mizzou in the NCAA regional final after the Tigers won two games on Saturday afternoon. Mizzou came back from a 1-0 deficit and a suspended game from Friday night to beat Illinois 5-1 thanks to two, two run homers and solid pitching from Chelsea Thomas. Then in game two, the Tigers held off a fiesty Bradley team who managed to beat top seeded DePaul yesterday 1-0. Mizzou won 2-1 thanks to solid pitching from Kristin Nottelman and Stacy Delaney who combined for a four hitter. In the first game, head coach Ehren Earleywine decided to come back with Thomas, the freshmen phenom who struggled in the first inning on Friday. She gave up a run and had runners on first and second with two outs when play was suspended due to lightning and rain. Thomas got a ground ball out on Saturday morning and kept Illinois at bay the rest of the game. The Tigers came out of the chute with a run in the bottom of the first and then a two run homer by Gina Schneider to left field with the wind gusting. Left fielder Kathryn Poet added enough insurance with a home run to left in the bottom of the sixth for the win. The Tigers got a run in the second inning against Bradley starter Ashley Birdsong on an RBI from Lindsey Ubrun. In the sixth, Poet would come up big again with a big at-bat driving in leadoff hitter Rhea Taylor who singled, stole second, and advanced to third on a bunt before Poet brought her in. The best thing that could have happened to the Tigers was the suspended game. It allowed their ace pitcher Thomas to reflect for the night on her nerves and what she needed to do to re-focus. Listen to the post-game comments below. The Tigers will play Sunday at 1pm and will have two chances to win one game.